UK video game retailer GAME has announced an exclusive partnership with Nintendo which allows it to sell software via eShop codes in-store and online. The agreement will allow Wii U and 3DS owners across Europe to purchase digital content for their consoles via GAME's chain of physical stores and via its website. Previously, GAME sold eShop cards for set values. However, this new system will allow consumers to purchase special cards for individual games — as is the case with select retailers in Japan. In the UK, GAME is also offering an additional 25% trade-in value on selected games against Nintendo eShop purchases made in store. 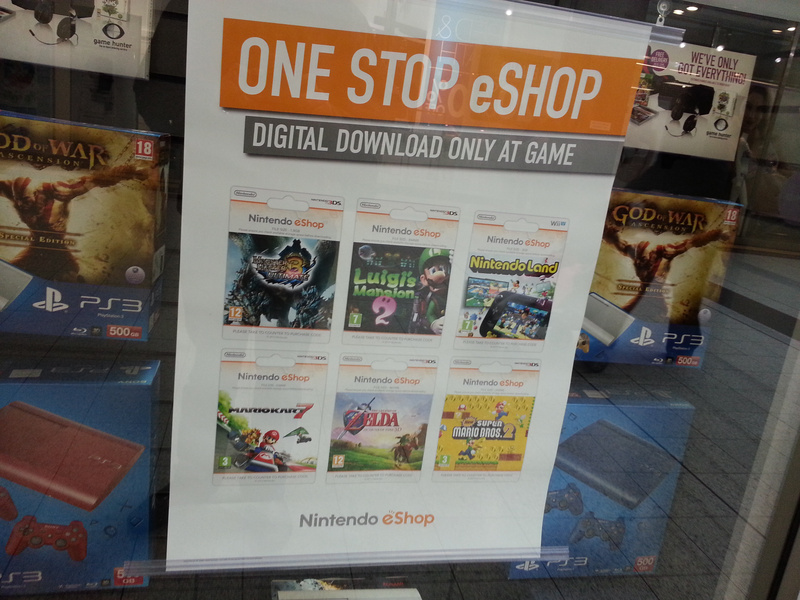 From today, GAME will become the first retailer in Europe to sell Nintendo eShop codes online and in store. The new offering, which coincides with the launch of Fire Emblem, is exclusive to GAME and will allow customers across Europe to purchase digital games for Wii U and 3DS consoles. Customers will be issued codes via till receipt (for in-store purchases) or email (when bought online), ensuring they are the first to get their hands on the latest games. Once activated, codes can be entered into the Nintendo eShop on the console and the game will be downloaded. The Nintendo partnership with GAME also makes it possible for gamers across Europe to purchase codes through its online store via PayPal or credit/debit card. For customers in the UK, GAME is also offering an extra 25% trade-in value on selected game trade-ins* against Nintendo eShop purchases in store. Charlotte Knight, Category Director for GAME says: “We’re really excited about this partnership with Nintendo, as it makes it so much easier for gamers to access Nintendo digital content, not just in the UK but across Europe. “We're thrilled to be able to offer brand new Nintendo Wii U and 3DS releases as digital download from day one of release, and that starts today with Fire Emblem Awakening on 3DS." What are your thoughts on this move? Will you be tempted to purchase codes in-store, or do you not see the point when you can simply make purchases via the console itself? Drop a comment to tell us your feelings. Nice but I'd rather get a box copy. Say a game-code is cheap on GAME's website. Will it be redeemable in other countries than the UK inside Europe? That would be nice. Given that prices are cheaper when buying from GAME online - Mario Kart 7 is £31.99 digital as opposed to £39.99 - I'd be very tempted to buy download codes if that trend should continue, yes. This is much better really. Lego City Wii U is £41.99 for a download code, which is a lot easier to stomach than £49.99 directly from the eShop. A step in the right direction! So are these counted towards your network premium total or not? @Spooky - I expect they will be. I got one of these "redeem codes" for Nintendo Land due to the screw-up with the Amazon Wii U preorder bundles, I was surprised to see that Nintendo Network Premium did credit my account for it in the same way as NSMBU which I bought direct from the eShop. Looking beyond the actual story, this is an Olive Branch from Nintendo to get at least 1 retailer on it's side. If you look at the problems Nintendo have had with low stock of Luigi Mansion, Monster Hunter, Need For Speed- plus the European delay of Injustice, it's obvious there has been problems for Nintendo stocking their product. Plus there was doubt if anyone would actually bother with any effort to actually stock a machine they wanted a price reduction on. This coupled with the 'multiplayer event' reported on earlier on Nintendo Life is a golden handshake with GAME to ease some tensions. Hopefully we'll also see some more promotion and stock holding of physical copies. Will be curious to see how this story will impact on HMV/Toy's R Us/Smyths/The Supermarkets. I'd rather get a boxed copy too. Does the extra 25% also include eshop vouchers, IE for VC games? Anyone know...? If there's a discount versus directly downloading from the eShop, absolutlely I'd get a download card from GAME - otherwise there's not much reason for me to go there at all! Well, it's a step in the right direction at least. I just checked their store online and they currently have six titles available as download codes (Monster Hunter, Nintendo Land, Maro Bros., Ninja Gaiden, Lego City and Sing Party), all priced at £41.99 (or £32.99 for Sing). That's cheaper than the eStore but still not as cheap as what they're selling the discs at. Some more open competition should result in this being a very good thing - I hope the exclusivity deal isn't for too long. 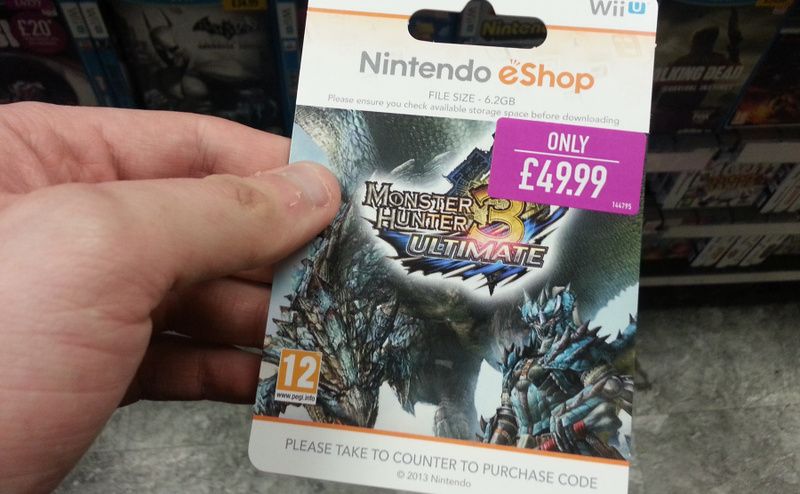 Whilst the Wii U download prices aren't very special; the 3DS prices are a lot more reasonable. Still not great, but better than the Eshop! Finally, download codes sold via retailers. So far I have seen some good prices, but if we get some sales then this would be a big hit. At the very least thanks to this exclusive deal, UK consumers now have a viable option to download retail games to their 3DS as the prices will now be closer to their competitors or even matched. @Banker-Style Me too. I want something on my shelf. I'm surprised and impressed they're actually selling them for less than they are on the eShop. I mean, I think the eShop prices are scandalous, being so much more than physical copies, but I didn't think it would be Game of all people to offer any kind of discount. Their in store prices are usually just as bad. I think they might just get my business when it comes to downloading Animal Crossing in June. If I'm going to download 3DS/ Wii U it will be through GAME if the prices stay the as reasonable as they are at the minute. Would it be possible for someone at NintendoLife to contact Nintendo or GAME and ask if they will be selling download codes of 'download only' games? I would do it myself but I've a feeling I'd get a useless answer. Thanks! @Majin-Naruto Personally, some games I'd prefer to have them always on my 3DS. Animal Crossing is pretty much the perfect example. I was so into the DS version for about a month, but then when I started to play other games, I found myself thinking it wasn't worth powering down the system and changing the cart just to check my mail in AC. If the game is right there in the system menu however, I'm going to be dipping into it for a long, long time. @Peach64 The eShop prices are scandalous because they're the RRP. Nintendo could've easily set the price lower or in line with the AVG retail price but that would undercut the retailers who are stocking their games. I think this is a good idea if you go in launch day and all box copies are gone. But I still prefer boxed games. Hang on a minute, why would I go out of my way to go to a physical store, to buy a download code for a digital version of a game that I could have downloaded from home without leaving the house, and pay more money for it than I would for a physical copy? And yes, £41.99 is cheaper than £49.99, but that kind of only applies if you pay £49.99 for games, and who actually does that? @CasuallyDressed You can download it from home via their website after you've bought it. One thing I have noticed is that all of the titles currently available as download codes from Game are published by Nintendo. I wonder if other publishers are free to negotiate their own deals? @Hunter-D Well yeah, I get that. But what I meant was I could just download it from my Wii U without going to GAME to buy one of these pre-paid cards. This has been common on other platforms so its just Nintendo playing catch-up. The sad thing is this is the future, regardless of which system/s you own this next gen your going to find less physical copies of games available at stores and more eCodes. Further down the line, Ps5 era and beyond you'll probably find retailers will sell Hardware, Gaming Merchandise and eCodes only. On the Plus side these eCodes will be treated much like game discs by the retailers, meaning they may or probably will be cheaper than a direct download from eStore and will be subject to promotions. Also buy the code online via game.co.uk and the code will be emailed to you direct. @Hunter-D The general concensus by Sony,Microsoft and although they havn't said as much, (Ms/Sony have said so), I assume Nintendo is that they purposly keep Download Prices at the RRP, (barring promotions), so as NOT to undercut retail outlets, thus potentialy having a negative effect on the retail outlets who can and do often sell games below the rrp. Fact is MS, Sony, Nintendo need retial outlets as a dedicated source for advertising of games/systems and as a dedicated outlet for hardware. If the dedicated gaming retailers were to go under, as GAME nearly did last year it would seriously damage the gaming industry itself. eCodes are going to the future format you will buy games as from retailers, saving manufacturing costs thru no or fewer discs being made, and lower distribution costs. Although for us gamers prices will still be around the same as now, the lower manufacturing, distribution costs will yeild a higher return for retailers, Developers and Publishers. Also as a side effect of eCodes, it pretty much shuts out the used game market in a more discreet way than a system (rumourd to be kinectbox) simply blocking used games. Thus not getting as big a negative reaction drawn to the situation, yet still giving publishers what they ideally want. But those are Retail games, while Japan has cards for e-shop games! Besides: If you go to retail, you just should go for PHYSICAL retail games! You know, box, card, the stuff! @GiftedGimp All fine and well (and I fully agree with you about publishers needing retail outlets as a dedicated source of game and hardware advertising/selling) but judging by Nintendo Of America's latest figures for 3DS online connection....what about the 33% or so of people who still aren't bothering to ever connect their consoles online? That's still a pretty big chunk of potential customers for publishers to lose by going the 'download only' route. @Henmii 30yrs i'vevbeen gaming and I've been die hard buy physical up unto about a year ago.. The Sooner you and others do as I did and come to terms with the fact that Physical Games are dying the better. Kinectbox, Ps4, WiiU, (possibly WiiU2 if nintendo release a new console in the next 5yrs) will be the last generation that will accept physical media. And even during these consoles lifespan Physical discs production will,(possibly have been MH3, NFS, LCU limited stock?) be reduced. Retailers are adapting to the what will be, us gamers, wether we like it or not will have to aswell... or stop gaming. Ps3/360/Wii.. The testing ground.. set things up and start getting people used to downloading thier games. Ps4/Kinectbox/WiiU.. Increase Digital sales, Reduce Disc media production, build on a framework which includes retail outlets but brings downloading more into the norm. Ps5 etc... (remember this is prob 7/8 years away) download only. By reducing Physical media production, increasing the Digital marketing with eCodes it will become the norm and more people will connect online, plus you'll find that the next Handheld Nintendo console (possibly 3DS with a future firmware update) will automatically try to connect to your Nintendo Network id everytime you sign in making not connecting online more abnormal. You've only got to look at the past 7/8 years, Xbox/Ps3/Wii got you used to downloading small file sized games, often less than 50meg, overtime these small games increased in size, getting to be as big as 1gb or 2gb in size, then a few retail games started becoming available for download, and now nearly all retail games are also available for download. Publishers want purly digital distribution, the console manufacturers need these publishers. If any one of them refused no publisher would keep backing that system, especially if the other two don't refuse and None of the console manufactures would refuse digital only in fear of being the only one. Also by effectively making it so if you want a new game you have to connect online it also gives the console manufacturers a chance to run thier security tests to ensure users are not using hacked/moded consoles. Which leads to why everyone inside the industry really wants Digital only games, Anti-Piracy, and Maximum Profits, which would in the mind of industry insiders at least negate the losses from those who don't connect thier gaming devices online. Wow, I'm guessing this would work for Australian users too (if they switch their region to the UK). This makes games considerably cheaper without having to wait for an import. E.g. Fire Emblem Awakening is RRP: $69.99 (eShop price), can be found in stores here for $64, but we can get the download code from GAME UK online for $52! Surely Nintendo Aus needs to step up to the plate!? Sorry, but I think it's a bad thing! And besides, Nintendo is the only company that still hasn't a proper id. When your console dies and you buy a new one you need Nintendo's help to get all your downloaded games back! Quite simply, you take a risk by downloading something from the e-shop! By the way, I do download stuff from the e-shop, but only stuff I can't get at retail! @CasuallyDressed Oh right, the pre-paid cards. I see what you mean now, I wouldn't do that either...unless there was some kind of sale/promotion. @GiftedGimp Thanks for the informative posts. @Hunter-D hello mate i just wanted to make sure you knew that buying a code from Game is cheaper than just buying a game from the e-shop.So it is very worthwhile if you would rather download a game and you don't have to go to the shop you can buy them online.I got fire emblem for 34.99 yesterday instead of paying 39.99 on e-shop.It is a good thing. I do not understand why this is not the case since the very starts and why only Game is interested in this. I do see the point in the idea Damien, because is more handy to have 3DS digital copies and if you can get them cheaper than on the eShop... Why not? Pity GAME shut their doors in Australia, but when they decided to cancel all preorders without refunding, their doom hastened as many people refused to shop there at all. @gazamataz Oh I know, I already have 4 retail downloads for my 3DS and plan to buy more in the future but I'm not a fan of digital retail games for my Wii U (except for special circumstances like SSB or Mario Kart) I prefer digital downloads for my 3DS as it goes hand in hand with its portability. Like I said earlier thanks to GAME, UK consumers now at least have a 'real' choice when it comes to digital vs physical. For example Next friday (26/4/13) LEGO City Undercover: The Chase Begins will be released in the UK. You can buy it for £29.99 both physically and digitally which is great to see! @Peach64 yeah i understand that but i mean if your in the shop why not just get the disc? you can always get the DL copy from home with out going to the shop after all isn't that the whole reason for it? @Majin-Naruto If all the other digital releases on the eShop are anything to go by, then Animal Crossing will be £39.99 to buy from there. Game are selling these codes for between £30 and £34.99. Another reason could be that people don't want to use their credit/debit cards to pay for things through the 3DS, so they can pay with cash in store, and still get a download copy. I can definitely see a market for it, but it will be pretty small yeah. @gazamataz I got a physical copy of Fire Emblem Awakening from Shopto for £29.99 inc. delivery, so I'm still not 100% as to why a lot of people would rather spend more money, have a game tied to their system and also fill valuable space on their SD cards that might be better used for downloading 'E-Shop only' games. I think it's partly my age (36) and me being a little old fashioned though, to be honest. Will be interesting to see if this has any influence on the prices. Personally for eShop only games over 20€ i'd prefer to have a download card to have at least something physical. But how much that would be worth to me i don't know. @ToxieDogg yeah shopto are brilliant I use them most of the time.Fire Emblem is just one of those games that I will play for a very long time so I would rather have it to hand.I still play The Sacred Stones from the GBA part of the Ambassador program so I think that influenced my decison.I will download Animal Crossing as well but I do still buy most games from boxes.I still by CD's as well.Not many mind because music is doodoo these days. Yes Nintendo need a universal id that your downloads are linked to rather than the device, but at the same time on the home console front the most common failure of a system is the media drive. With WiiU you will need a external HDD to download titles regularly and the knock on effect is by downloading titles your not using the media drive, reducing the chance of a console failure. Also on the other hand in the rare occurance if a HDD failure, you'll simply need to buy a new HDD and redownload the software which will still work due to the WiiU still being the original console it was downloaded too. In some ways, from a wear n tear angle, you could argue that if you any intention of downloading VC titles or game dlc, you would be better off downloading full games so as to reduce WiiU wear, which if it fails you would lose your VC/DLC content. Unless you sent your system to Nintendo for repair. 3DS is a different story, of course, hence why I agree Nintendo need to link downloads to the Nintendo id. It will happen but not untill the next Nintendo handheld or a firmware update to the 3DS, that replaces the Freinds code system with the Network id system on WiiU. @Henmii @ToxieDogg I'm not saying going Download is a good or bad thing. I'm saying it how thing are going to progress. Only a few years ago PC gamers were opposed to digital only now it virtualy the norm and on the whole accepted as thats the way it is. From a Gamers point of view there's both a positve & and negative sides to both physical and digital games. This is a smart move. It gives the consumer yet another choice. We have download codes available at retail in the US, thats how I bought my copy of Luigi's Mansion:Dark Moon. I just wish we had these fancy cards. At Gamestop, my download code I bought for Luigi's Mansion was just a number printed on my receipt. No fancy card. So you basically say that using a harddrive does lenghten the life of the Wii u? Yes, that could be the case! And when I have a Wii u, I guess I'll also get a harddrive some day! Harddrives do have the tendency of breaking easily though, or so I heard! It probably depends on what kind of harddrive you'll buy! But as you said: If the harddrive breaks, you can easily download the games again. However, I can't get behind your other argument that I basically have to move with the times! Yeah, I am old-fashioned! I'll buy physical copies at retail as long as I can! !